If you like action movies with deep characters and an intellectual bent, then The Accountant is worth checking out. Ben Affleck does a great job in this one tackling a role that brings awareness to autism in a very weird way. Rather than showing how people with autism can go on to live normal lives, The Accountant shows how they can be deadly assassins and super criminals. As tongue and cheek as that might sound, the movie really does have some great characters and tells a very entertaining story. At the helm is director Gavin O’Connor who has done some tv work, but also did Jane Got a Gun which came out earlier this year. Through this film, he tells what could have easily been just another Hollywood action flick. Ben Affleck is an accountant who handles the books of some very notorious criminals, and as such, has to deal with the violent fallout that comes in the business. Rathern than being a typical bookworm, he’s full on Jason Bourne as he takes bad guys out in hand-to-hand combat or with an arsenal of weaponry. Yet this isn’t a film that’s about action and explosions. Instead, it builds characters and lays out a story with a couple layers to it. There are bursts of action in between long periods of character development. It’s not a movie that’s all out action. There’s also some jumping around in the timeline with flashbacks, but the movie does it very well so even when it jumps around, it does so rather seamlessly. Adding a bit of color to the film, Ben Affleck’s character is autistic. Now the movie isn’t actually pushing autistic people to go out and become assassins, but it does bring awareness to autism. In fact, the film causing you to bond with Affleck’s character, and in through doing so, it makes you think about autism, the challenges, the people who live with it, and the reaction of other people toward autism. Without being heavy handed, this is an action movie that rather creatively interjects autism to heighten awareness and open people’s minds up. And it’s a movie that’s a lot of fun. Aside from Affleck, there’s a good supporting cast in this film. Cynthia Addai-Robinson, J.K. Simmons, Anna Kendrick and Jon Bernthal all get sizeable roles with lots of scenes, dialog and character focus. Rounding things out are some smaller roles played by John Lithgow, Jeffrey Tambor and Robert C. Treveiler. They all come together to tell a tale about an accountant who is much more than he seems. 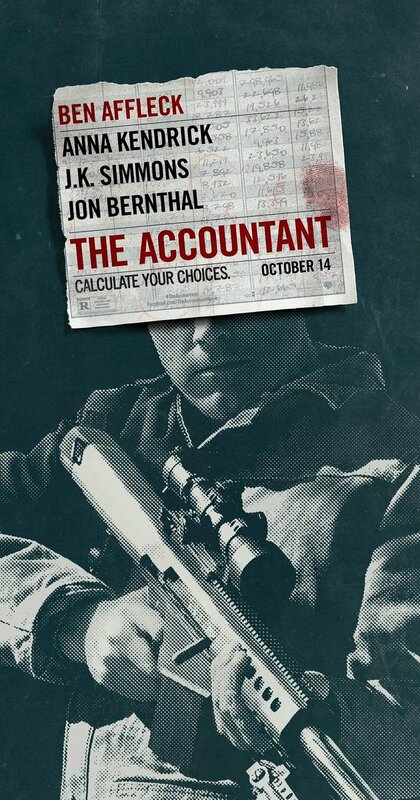 If you’re looking for something intelligent with some depth and rich characters but is still an action movie with the typical gun fights and sudden violence, The Accountant is definitely a movie worth checking out. I give it a five out of five metal bikinis.